This reversible cufflinks, The Winner 2016 AGTA Spectrum Awards – Men’s Wear, feature two pair of ‘boat’ shaped carvings – one in black onyx and one of white rock crystal. Inter CHANGE reversible cufflinks featuring two pair of ‘boat’ shaped carvings – one in black onyx and one of white rock crystal. The white boats are set in yellow gold and black boats in white gold. The end caps are accented with black and white diamonds. Captured in each boat are round black and white South Sea keshi pearls which are free to roll back and forth in the boat, secured by gold rails. 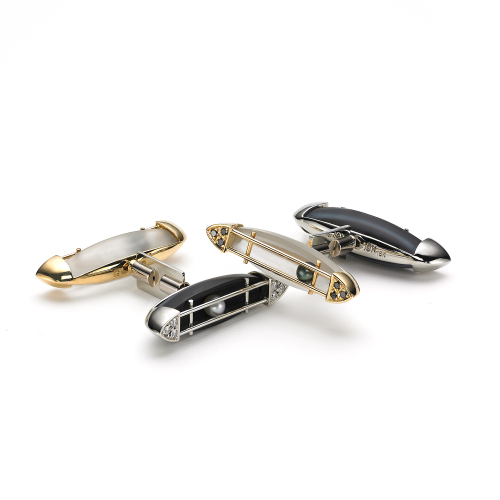 Cufflinks are designed to be fully interchangeable with interLINK double bayonet findings – both sides of the links are removable so that other fronts and backs can be used to give a gentleman a wardrobe of cufflinks. Carved onyx and quartz boats measure approximately 30 x 8 x 6 mm.